The Siberian city of Krasnoyarsk (current population around 975,000) is the capital of one of Russia's largest administrative regions, stretching from the Republic of Tuva , which shares a border with Mongolia, all the way to the Kara and Laptev Seas in the Arctic Ocean. The Siberian city of Krasnoyarsk (current population around 975,000) is the capital of one of Russia's largest administrative regions, stretching from the Republic of Tuva , which shares a border with Mongolia, all the way to the Kara and Laptev Seas in the Arctic Ocean. Founded in 1628 as a frontier outpost on the southern reaches of the mighty Yenisei River, for the first century of its existence Krasnoyarsk consisted of little more than a Cossack detachment. Its name is a Russian translation of the original site name, “red riverbank,” in the local Khakas language. For the first century of the settlement’s existence, life for the local Cossacks and peasants hardly rose above subsistence level, particularly with the harsh Siberian climate. Yet, the area's rich natural resources eventually gave rise to industrial and craft production during the 18th century, particularly after the subduing of the southern steppe tribes and the opening of the Moscow Road (1735-41), a more even, southerly route that redirected settlement and transportation in Siberia. Copper smelting and ironworking factories were in operation by the 1750s. Throughout this period, the vast territory along the Yenisei River was administered from the town of Yeniseisk, located some 200 miles to the north of Krasnoyarsk. After a fire destroyed much of the town in 1773, a military engineer from the Siberian capital of Tobolsk redesigned the town plan with a regular street grid. As in other Siberian towns, Krasnoyarsk originally consisted of log structures, but by the turn of the 19th century, the presence of a few brick churches reflected local prosperity. The most impressive of them was the Church of the Intercession of the Virgin, built in 1785-95 and decorated in a florid manner typical of late 18th-century Siberian architecture. The structure was restored in the 1970s and has since been returned to the Orthodox Church. It now serves as the main cathedral of the Diocese of Krasnoyarsk and Yeniseisk. Also imposing is the Church of the Annunciation, built in 1804-12 as the main church of a convent of the same name. In 1822, Krasnoyarsk was designated the administrative center of Yeniseisk Province. With this enhanced recognition, the town won the right to a new layout, designed under the supervision of Scottish architect William Hastie, architect to the imperial court in St. Petersburg. His work continues to serve as the basis for central Krasnoyarsk. Despite a few brick commercial buildings, masonry construction in Krasnoyarsk for most of the 19th century was confined primarily to religious architecture. The most visible example was the octagonal tower Chapel of St. Paraskeva, built at the top of Lookout Mountain in 1852-55. Its visibility is maintained to this day, not only in Krasnoyarsk but also by virtue of the chapel’s depiction on the common Russian 10-ruble note. As with Omsk to the west, Krasnoyarsk was transformed in the late 19th century from a provincial garrison town into a major transportation center by the construction of the Trans-Siberian Railroad, begun in 1891. By 1895, Krasnoyarsk was connected by rail with European Russia, and subsequently with Irkutsk and the Far East. The conjunction of rail and river proved an enormous boon for the city’s growth. Its economic activity gave sustained a merchant elite, prominent among whom was Gennady Yudin, a bibliophile who sold much of his valuable collection of books to the Library of Congress in 1907. Other prominent cultural figures included the painter Vassily Surikov (1848-1916), whose house has been preserved as a museum in the center of town. 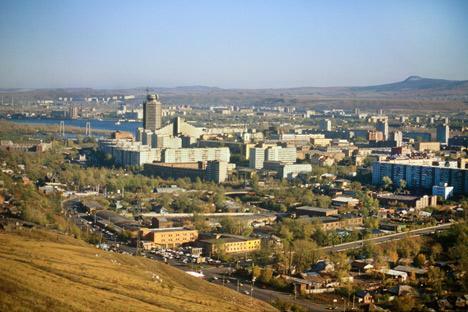 At the turn of the 20th century, Krasnoyarsk gained many prominent commercial and residential buildings. In 1914, the city opened its new museum, an imposing building designed in a neo-Egyptian style. New houses of worship included Lutheran churches as well as the large, neo-gothic Church of the Transfiguration, built in 1908-10 to serve the region’s numerous Roman Catholics, many of whom were descended from Polish exiles. The local Jewish community, formed in the early 19th century, now has a new community center to complement its historic synagogue. After the revolution, the industrialization campaign of the 1930s led to the construction of major new sites for heavy industry in Krasnoyarsk. The evacuation of factories from the European part of the Soviet Union in 1941-42 added to this process. The city subsequently became a center for hydroelectric power and aluminum production. Growth during the Soviet period was reflected in the construction of a number of large public buildings. Some of Krasnoyarsk’s growth around this time can also be attributed to its position as a center of the Gulag system. In the immediate post-Soviet period, the population and economic strength of Krasnoyarsk declined noticeably, but the city has rebounded in recent years. The first stations of a long awaited subway system are scheduled to open, and the city’s population is expected to reach the benchmark one million figure by the middle of this decade. Krasnoyarsk is home to major educational institutions such as the Siberian Federal University, a mega-institution formed by the merger of four previous universities. Cultural institutions are diverse and active, particularly in the sphere of music, whose most famous product is the remarkable operatic baritone Dmitry Hvorostovsky. Like many Siberian industrial cities, Krasnoyarsk has had a mixed record in preserving its architectural heritage. Fortunately, the city’s surviving ensembles of historic architecture – secular as well as religious – have been carefully studied and preserve a sense of cultural continuity in the midst of rapid development.